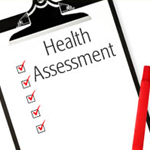 The following are provided to help you assess your general health. No self-assessment tool can replace a visit to your physician. Please see your family doctor for any health related concerns. *Northwestern Mutual’s “Lifespan Calculator” considers 13 lifestyle factors including diet, drinking, smoking and stress to estimate a person’s life expectancy, based on the latest actuarial data from the National Center for Health Statistics. People who have a sense of their own longevity can better manage their financial futures for the long term.